I started making footwear under the tutelage of this book, and eventually met Christine many years ago. The chapter that was always relevant to me is the one on How to Make Strap Sandals. I’m reproducing it here, if you ever discover that I’ve posted this chapter, Christine, and want me to take it down I will do so. I like the strap configurations that she offers, especially the continuous strap one. Her simple flip-flop patterns didn’t work for me, and I don’t like the padding in the sole, I prefer to use an 8-10-ounce piece of vegetable-tanned leather for the topsole. I hope this will get you started, and I do offer two sandal-making books if you’d like to work with my directions and more patterns. 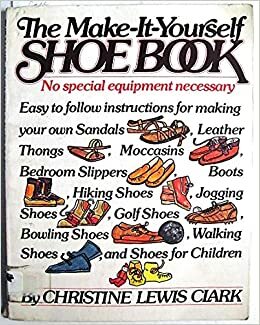 You can see that the book has directions for making many styles of footwear, but the sandal chapter is the only one that I think is useful.